Ballerinas from Dance Ireleand and The Hit Machine at the launch of the Culture Night programme today. AN EXHIBITION TO celebrate Seamus Heaney, a workshop by an Oscar-nominated film studio, and a currach race are among over 4,000 events that will take place as part of this year’s Culture Night. Up to 1,600 venues across the country will open their doors on 21 September as they host a late-night programme of free events for people of all ages and cultural persuasions. 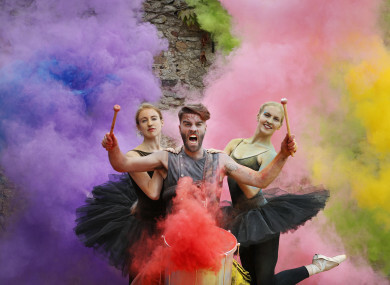 The 2018 programme, which was launched today, contains events in all 26 counties which hope to showcase Ireland’s creativity, storytelling and culture. Organisers are hoping to build on last year’s turnout, when more than 400,000 people experienced the evening of free events. Dublin highlights include an exhibition at the Bank of Ireland Cultural and Heritage Centre to celebrate Seamus Heaney, a workshop by animation studio Brown Bag, and Currach Racing on the River Liffey. Elsewhere, folk musician Luka Bloom will perform in Kilkee, Co. Clare, a night of African dance, Palestinian Dabke and Irish Céilí will take place in Kerry, while Tipperary author Julian Gough will read from his new novel at Cashel Library. Meanwhile, The Concert Hall in Cork City will host an event with Evelyn Grant and the Cork Pops Orchestra, playing a range of music from Johann Strauss to Abba, while in Galway, Croatian artist Tomislav Branjovic will install of a series of murals on the theme of love becoming a dictatorship. Speaking at the launch of this year’s programme, Minister for Culture, Heritage & the Gaeltacht, Josepha Madigan said Ireland was lucky to have a rich and varied culture. Madigan also hoped people would be encouraged to enjoy “an evening of cultural discovery” by exploring the programme in depth before 21 September. Email “Open-air gigs, Oscar-nominated film workshops, and river racing: Culture Night programme goes live”. Feedback on “Open-air gigs, Oscar-nominated film workshops, and river racing: Culture Night programme goes live”.